Yosemite Nationalpark. A name closely connected with so may words. Wild. Magical. Impressive. Bears. Raw. A long dreamt dream and a destination worth many troubles. Obviously the four of us would beat that rusty, old van up and down those steep mountains of this breathtaking place. And so we did. Up and down deeper and deeper into the wild. Always on the lookout for bears. And after only 20 minutes that paid of. We saw our first wild bear. Ikarus barked and growled and we were super stoked. But we found it very hard to find the solitude and the wilderness everybody connects to Yosemite. The traffic was huge. And long lines of traffic built up behind our slow van. Every beautiful sight was easy accessible by road and the breathtaking viewpoints always had a huge parking spot and a shuttle stop there. But is that what you’re looking for when you go out into nature? Is that wilderness? So we got up even earlier and avoided the crowd when we started hiking with the first rays of sunshine. And than we found an almost lost path. Covered with dead trees and rockslides it climbed up into the steepest mountains. It challenged all four of us but it was pure magic. It was raw and wild. And around every corner we expected to run into family of bears. And even though that didn’t happen this trail gave us everything that we wanted to find in Yosemite. What an incredible place. 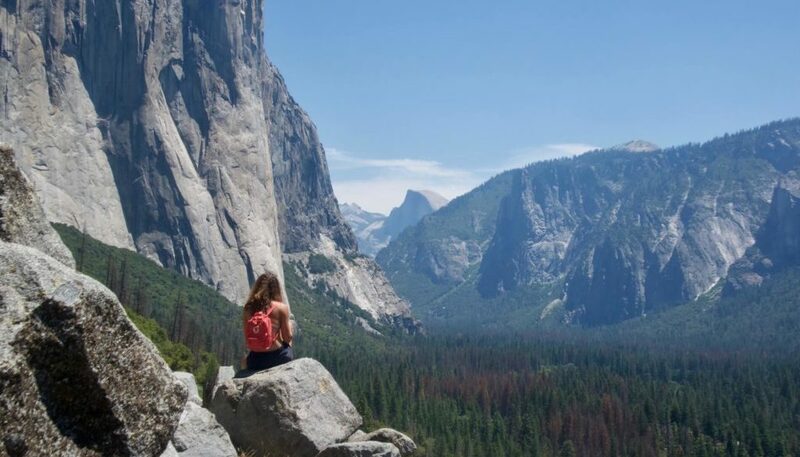 Stunning views, loneliness and untamed wilderness will forever be our memory of Yosemite.